But Peter was not the founder of the Catholic Church, nor the first pope nor the rock. He was named pope by the Vatican hundreds of years after the apostle Peter had passed away. Moreover the Catholic church doesn’t teach the same doctrine that the apostle Peter taught. . .but this is another topic for another time. Let us study a little more about the bible verse above. We cannot emphasize enough how important is to study & read the bible in context, taking verses out of context causes confusion & division among believers, it does much harm to the gospel & to the body of Christ. Taking verses out of context means we are not rightly dividing the Word of truth (2 Tim.2:15), it shows we need to study the bible more deeply (specially before becoming teachers of the Word), it also may indicate spiritual immaturity. It is normal for recent believers to be carnal or fleshly. Spiritual maturity doesn’t happen over night, it requires time, it requires daily submitting to the Holy Spirit and a good knowledge of the Word of God. However Paul’s admonition reveals that he felt the believers at Corinth should have grown but they had failed to do so, they were still walking in the flesh. The apostle Paul was writing his concerns to the church of Corinth after hearing there were divisions & strife (carnality or works of the flesh) among them. We notice in this verse of Galatians about work of the flesh, that the apostle Paul used exactly 3 of the sames words he said to the Corinthians. Divisions, Jealousy and strife are not the only signs of fleshiness, but these were some of the most evident things among the Corinthians. 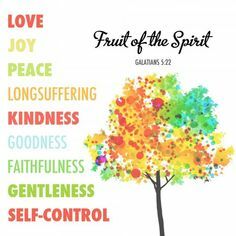 The fruits we should look for in the church, mainly in teachers & leaders are the fruit of the Spirit, not how big their ministry is, or how many people they reach, nor how many books they wrote, etc. Instead, how much they love others? are they protecting the sheep from false doctrines, serving even the least of them, or are they using them for personal gain, to acquire recognition or power? are they following Christ example as a servant? The Corinthians probably thought of themselves as spiritual people, but their strifes showed that they were in fact fleshly. The problems they were having in their human relationships showed there was something wrong in their relationship with God also. It was evidence of carnality, of a fleshly way of thinking and living. We humans have a tendency to make idols. In idolatry we put something or someone, usually a gift from God, in a place of value that takes the first place owed to God alone, the gift Giver. What caused the strife & dissensions among the Corinthians? They were following men, leaders, teachers. It seams they were getting too attached to the person through whom they came to believe in Christ, or may be some were looking for the most anointed or the greatest teacher to follow him. They got their eyes off the Lord and on the Lord’s servants, and this led to competition. This behavior of following men is common in many Christian churches today, it’s known as ‘Cult of Personality’. Followers of men identify themselves with their leaders rather than with God. In this case they even said I’m of. . . like they belonged to them. Paul calls these carnal Christians ‘brethren’, (they are not unsaved/natural man like 1 Cor. 2:14) but they are not behaving like spiritual Christians either, rather they are behaving like carnal people- that is, fleshly -people, like immature Christians or babes in Christ. Apollos was a converted Jew who worked for the Lord, mainly in Ephesus and the province of Achaia which capital was Corinth. It is understandable that some may liked his teachings, he was eloquent & mighty in the Scriptures, but the problem was when many were taking this favoritism to a point where it was causing division among members of the same church. The division in Corinth that Paul addressed (1 Cor. 3) was NOT DOCTRINAL, ALL of these teachers mentioned there, were teaching the same doctrine, the same gospel, the same Lord Jesus. They didn’t have different denominations, for that reason is NOT talking about unity among different denominations or faiths! Besides, accepting a different doctrine would be a contradiction and there are not contradictions in the Word of God, there is only a lack of information on our part or we are taking verses out of context. There is only one spiritual truth! Teachers & doctrines (teachings) go together, hand in hand. That’s the reason the bible warn us about false prophets & teachers, because of their false doctrines. How can God tells us in His Word to avoid them which cause divisions and offenses contrary to the doctrine we learned (Romans 16:17-18), or tell us heresies are works of the flesh, to later tells us we are carnal/fleshy if we avoid them? that would be a terrible contradiction, it wouldn’t make any sense. For this & many other verses we find in the bible, we know God want us to guard sound doctrine. 1 Tim 1:9-10; 6:3; 2 Tim.1:13; Titus 1:9; 2:1; 1 Timothy 6:3-5; 1 Tim 4:6; 1 Cor.11:1-2; Galatians 1:6-10, Romans 16:17, 2 Tim.4:3-4, 2 John 1:9, 2 Thess.3:6, 2 Cor. 6,; Col.2:8, etc. “Who then is Paul, and who is Apollos, but ministers (G1249 = servants) by whom ye believed, even as the Lord gave to every man?” vs. 5. – We don’t belong to any men, nor to the ministers or servants through whom we came to believe in Christ. They brought Jesus gospel to us. They are just laborers through whom we believed, not on whom we believed. No man should glory in men. We belong to Christ alone. “I have planted, Apollos watered; but God gave the increase. So then neither is he that planteth any thing, neither he that watereth; but God that giveth the increase. Now he that planteth and he that watereth are one: and every man shall receive his own reward according to his own labour. For we are labourers together with God“. vs 6-9. We are one body, a team work. We might think Paul would be more kind to his own “fans/followers”, but instead of letting their praise get to his flesh, Paul denounced fleshy followers and diminished himself & exalts God. That’s what a true man of God would do, point people to God & not to himself. This is also a lesson for us, the contemporary Church: Christians must always center their loyalty, their love and devotion upon Jesus Christ and His word, not on individuals. No leader is to be the focus of Christian fellowship. How can we call ourselves Christians if we don’t follow Christ or His Word but rather follow men? Our advise…let no man glory in men, do not follow men Mark 7:6-7 but the son of God, invite Jesus Christ into your life, accept Him as your Saviour, your Lord, study His Word and follow Him.